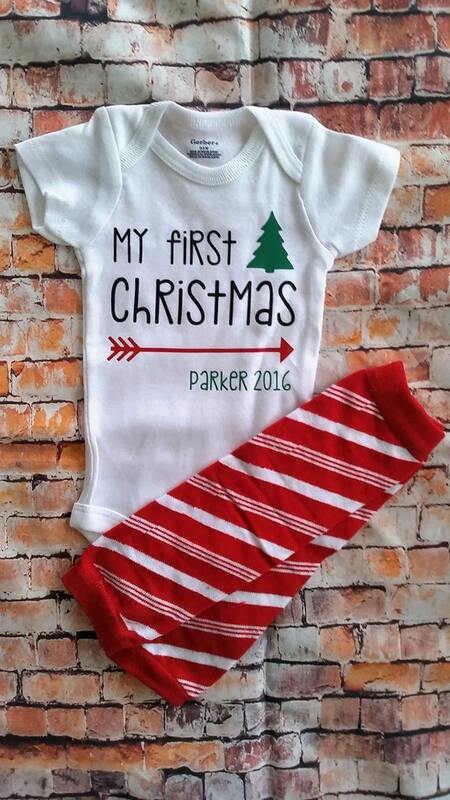 This listing is for a personalized My First Christmas onesie. My First Christmas is in black vinyl. The tree and the name are in green. The arrow is in red. 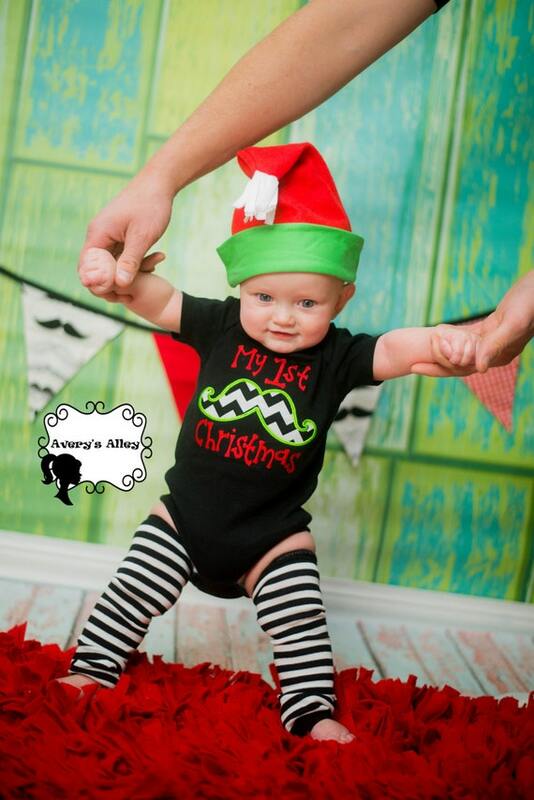 The candy cane striped leg warmers are optional. 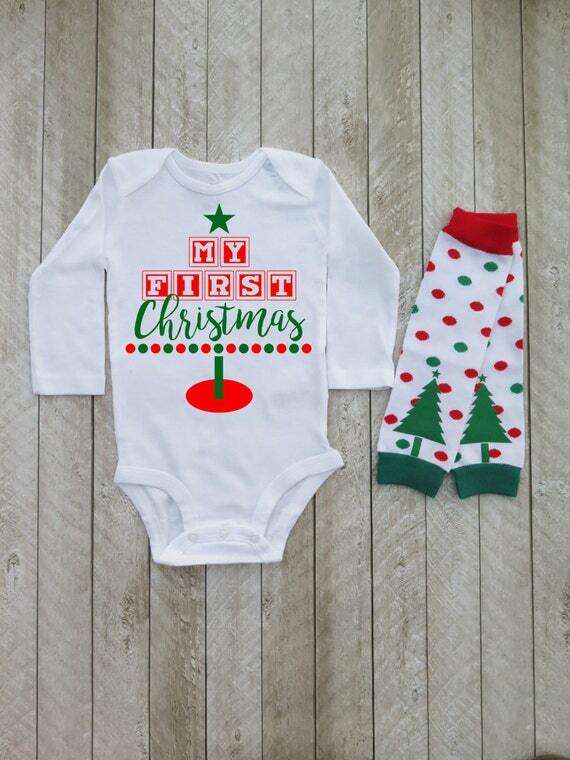 There’s no other perfect way to show off your little one at Christmas time than with this My First Christmas outfit for your baby boy or baby girl! Find your perfect combination of the outfit in the selections to the right. 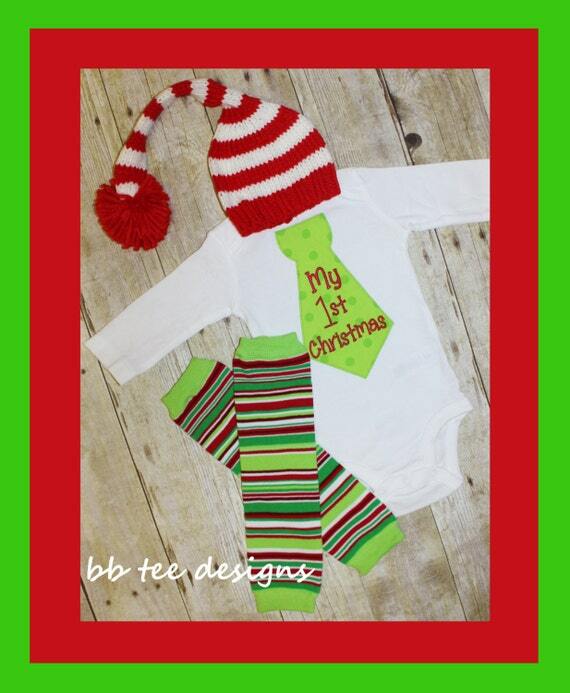 Short or long sleeve white bodysuit with green and red design. 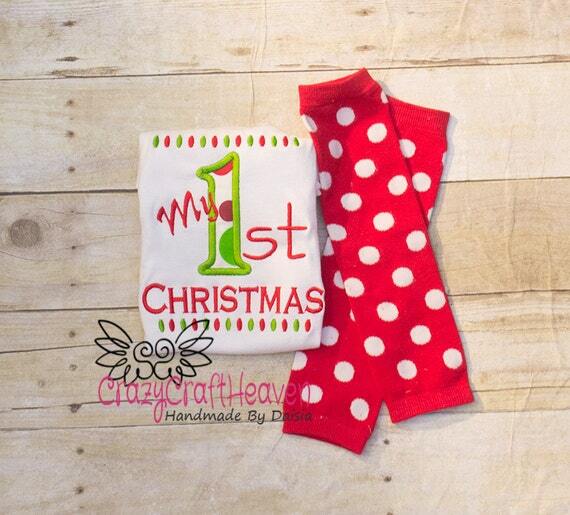 Red and green polka dot baby legs embellished with green christmas trees. One size fits most. 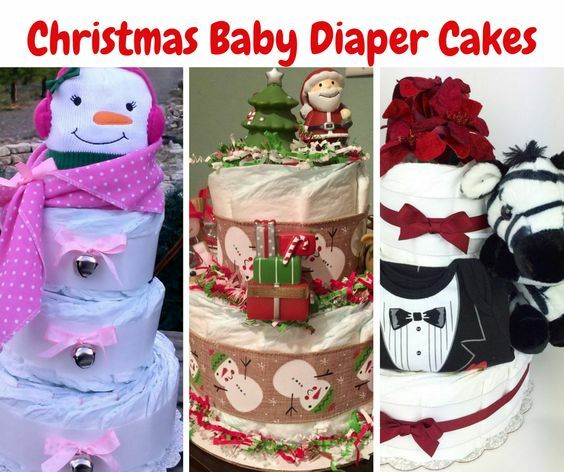 You will find that these fit sizes 3 months and older best. This listing will no longer be available. 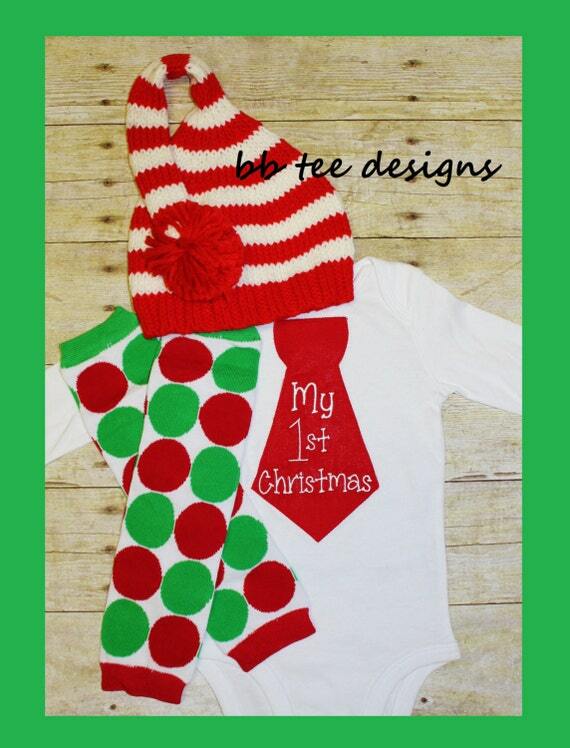 This listing is for one adorable red and white striped hat, white appliqued bodysuit with “My First Christmas” tie, and one pair of one size fits most striped leg warmers. 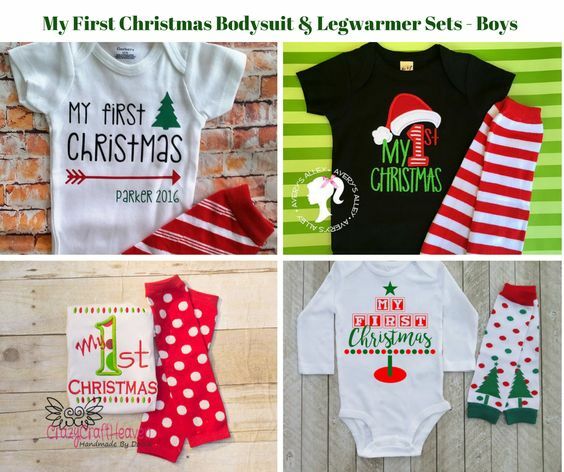 This set is adorable for Christmas pictures, a holiday party or Christmas at the in laws. 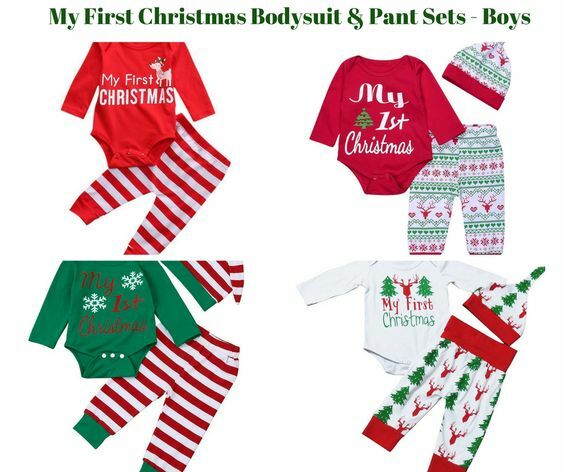 Bodysuits are long sleeve NB-12 months. Hat size will be determined by what size onesie you choose. Leg warmers are one size fits all and will cover a full leg with scrunching on the smallest ones and half leg on longer walking legs. This design is machine embroidered and appliqued for a secure, great look! A cover is heat pressed to the inside of the shirt to prevent the design from scratching your child’s delicate skin. The bodysuit is a lap shoulder sleeve style, runs true to size, and is 100% cotton. The shirt is a basic unisex style t-shirt, runs true to size, and is 100% cotton. 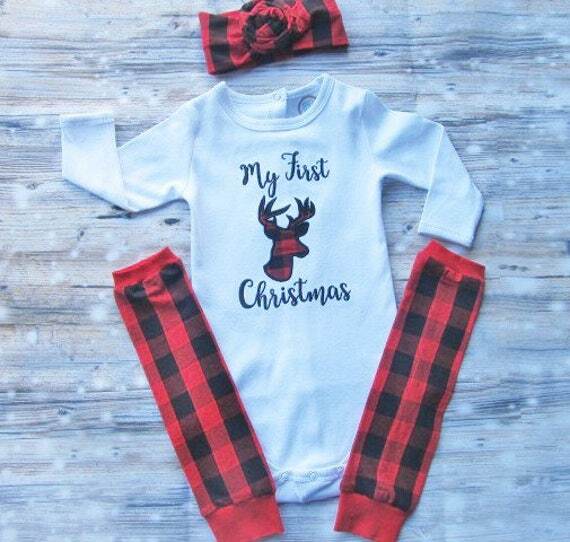 Adorable baby girl’s first Christmas outfit with appliqued deer silhouette on white long sleeve bodysuit, your choice of ruffle sleeve or not, with matching leg warmers and your choice of headband, knotted rose or tied knot. All embroidery on the back of shirt is covered with soft covering so as not to irritate baby’s soft skin. All embroidery and sewing done in my smoke free, pet friendly home.